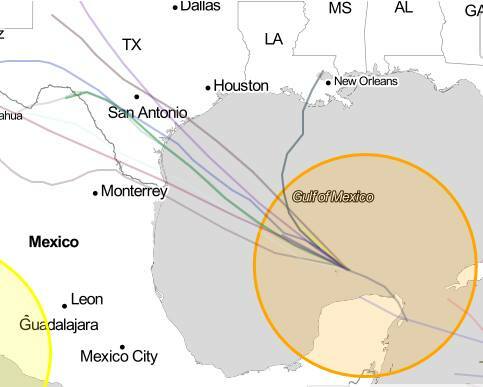 IF (BIG IF) these models hold true, we MIGHT (BIG MIGHT) see a little rain out of this, but from what I am seeing, those who live South West of the Angelina/Cherokee county areas and farther down South towards the Gulf Coast area will get the heaviest. Cloudiness and showers associated with a trough of low pressure over the south-central Gulf of Mexico have decreased since yesterday and the Air Force reconnaissance plane scheduled to investigate the system for today will likely be canceled. 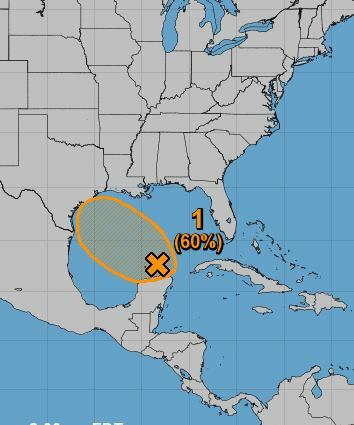 However, upper-level winds are forecast to become a little more conducive for development and a tropical depression could still form Thursday or Friday before the system reaches the western Gulf Coast. Regardless of development, heavy rainfall and gusty winds are expected across portions of northeastern Mexico, Texas, and Louisiana late this week, and interests there should monitor the progress of this system.